Tigers are known as being one of the greatest predators on earth. The great body design of the tiger makes them so fast and graceful when hunting. Although tigers themselves do not have very many predators, they are still endangered due to the decrease in natural habitats, human conflict, and most of all, poaching. Tigers are listed as endangered with only less than 3,000 tigers still remaining. There are eight different subspecies of tigers, but two of them are extinct. Tiger cubs are born in a den and will stay there for many weeks before coming out. A full grown tiger is usually anywhere between 8-11 feet in length and an average weight of about 265 pounds. Tigers look for three things when it comes to finding a good habitat, cover, and a good source of food and water. The skull and teeth of a tiger. The great body design of the tiger is what gives them their graceful movements and allows them to move super fast when it comes to hunting. The male tiger is generally larger than the females for all of the different species. The females usually average to around 7 feet in length and about 200 pounds in weight. The male tigers can usually range from 8-11 feet in length and weigh an average of about 265 pounds. Tigers are vertebrates which are animals that have a backbone or spine going down their back, and they have an endoskeleton meaning that the skeleton is inside the body as opposed to an outer shell. The skeleton of all tigers are relatively the same. The configuration of their bones and ligaments are what makes them such an extraordinary creature. The tiger's skull is a great design because it protects the eyes and brain, but it also allows the tiger to have the maximum amount of strength in its jaw. The short and rounded skull puts all of its support and power into the teeth and jaws. The tiger's skull gives the brain more protection because the septum, the part that separates the cerebrum and the cerebellum, is made of hard bone while the human's is just made up of membrane. The main internal organs of the tiger are the lungs, heart, brain, liver, stomach, kidney, intestines, and bladder. The long spine that extends to the tip of the tail is what gives the tiger extra strength and flexibility. Just like how every human has a different fingerprint pattern, so does the tiger with their fur design. Because each tiger has their own unique stripe design on their fur, researchers are able to identify certain tigers. The mouth of a tiger has about 30 razor sharp teeth designed to hunt and tear into their prey. But when the tiger gets older their teeth wear out making it harder to live in the wild because they might starve. All cats have milk teeth which are similar to humans' baby teeth as they are temporary and come within a week or two after birth. The canines of tigers are the largest teeth of all big cat species ranging from 2.5 to 3 inches. Their canines have pressure-sensing nerves which allow them to help identify where the neck of its prey is. The back teeth are called carnassials which are like knife blades as they are used to shear meat from their prey. The small incisors in the front of the mouth between the top canines are used to pick off meat and feathers from their prey. The tiger has five extremely sharp claws on each foot, but the first claw never touches the ground. They have sheaths that cover their claws to prevent them from getting worn out when they don't need to use them. The paws of tigers help them to climb and grasp things but the paws of males are usually much larger than those of the females. The legs and shoulder regions of tigers are extremely muscular. The hind legs are longer than the front legs giving them the ability to jump up to 32 feet. The bones in the feet of the tiger are tightly connected by ligaments to enable them to buffer the impact when running or leaping. 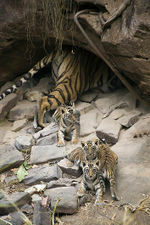 Tiger cubs and mother by their den. Tigers reproduce sexually meaning that it requires a male and a female in order to have cubs. Before the courting process, the female has to first let a male know that she is ready to mate. She does this by urinating within a certain area with a distinctive-smelling urine. This lets the male know that she might accept his attempts to mate. During the courting process, the tigers make different whines and howls for each other. The males usually start this and females usually responds. When they come into contact, they dance, smell each other, purr, and even rub up against each other. Some mates might even lick and groom each other as well. When the male and the female do actually decide to mate, they will engage in the act multiple times over the course of a few days. The male can mate with several different females as long as he remains healthy. There is not a set mating season for tigers, but November to April is when mating is most frequent. After mating, the male and female will part ways. The average gestation period for tigers is about 103-106 days, but can range from anywhere between 97-110 days. During gestation, the female has to create or find a den so that the young can be born and stay safe. The cubs will stay in the den for many weeks before coming out. The cubs are born about 2 pounds each. The average litter size is about 2-3 cubs, but can range from anywhere between 1-7 cubs. The age at which weaning occurs is about 3-6 months. The age at which sexual maturity happens is usually 4-5 years for males and 3-4 years for females. The female can mate again in about three years depending upon the sexual maturity. Even though the female does everything she can to protect her cubs, more than 50% of them will die before the age of two, do to brush fires, harsh rains, or sometimes even the attacking of adult male tigers. This makes it hard to increase the numbers of tigers in the wild. The average age for a tiger that does survive in the wild is still only about 8-10 years, but in captivity it is closer to 16-18 years. A tiger hidden in tall grass. The historic range of tigers runs all the way from Turkey through South and Southeast Asia to the far east. But today, they can usually only be found in South and Southeast Asia, China, and parts of Russia. Tigers have many different types of habitats. Some of which are the tropical forests, evergreen forests, woodlands, swamps, grasslands, savannah, and rocky places. Tigers are usually looking for 3 main things when trying to find a good habitat, cover, food, and water. Tigers like tall grasses because it gives them the cover they need to stay hidden from their prey. Along with their colors and stripes, long grassed areas make tigers almost invisible because of camouflage. Tigers love cooling off in water and are very great swimmers. They need to have a great variety of prey to hunt and will move to a different place if there is not enough prey. Tigers usually live alone and are only with another tiger when they are looking for a mate. Tigers are known as being great hunters. Because they are carnivores, they prefer large prey but will eat almost anything that they can catch and kill. Some animals that they hunt are wild boars, buffalos, wild cattle, deers, antelopes, and even weak or young elephants. If these big prey are not available than they will go for some smaller prey such as lizards, crabs, toads, birds, and fish. It is almost impossible to escape a hunting tiger. With the combination of their great camouflage and being able to reach speeds up to 50 mph, prey can't do much to escape a tiger. Since tigers are one of the greatest predators themselves, they don't have to many animal predators. The buffalo is a threat because of their powerful kick, bears can also be threat do to their great claws, and elephants will occasionally attack a tiger in order to protect its young. The main predator of tigers are humans. The stretched out skin of a killed tiger. Tigers are globally listed as endangered. Two of the eight tiger subspecies are extinct. Only one hundred years ago, there was about 100,000 wild tigers in Asia. But today, there are less than 3,000 wild tigers which are occupying only about four percent of their original range. There are multiple reasons why the population of tigers can decrease. One is because of the loss of habitat for tigers. If the habitats of the tigers disappear, so do the tigers. Another one is because of the competition between tigers and humans. Tigers and humans compete over land and other animals. 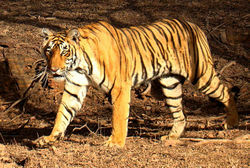 Tigers hunt the same animals as local people, such as deer and wild pigs. And finally, humans kill tigers. Humans shoot or poison tigers when they feel threatened by them, but the cause of the most tiger deaths is because of poaching. Poaching is the illegal killing of wildlife, in violation of local, state, federal, or international law. Poachers hunt and kill tigers to illegally trade or sell the tiger's skin, bones, teeth and claws which are all highly valued. The amount of poaching is the determining factor as to if tigers will be extinct or not. 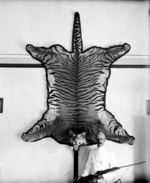 Even tiger organs are still sold on the black market today to be used as medicine to cure ailments in China. In 1990, over 4,000 pounds of tiger bones were exported from Taiwan to Japan. Some bones can be sold for as much as $1,700 per pound. People used to even kill tigers simply because they thought that the consumption of tiger whiskers would prevent toothaches. Most poachers kill tigers by setting steel traps near known tiger trails. Once the tiger is trapped, it is left to struggle and exhaust itself until it finally dies. Another way that poachers kill tigers is by poisoning the carcasses of a tiger's prey or by poisoning pools of water in hot weather. Poachers also kill tigers simply by shooting them with guns. A video about the early courting process between two tigers. ↑ Panthera tigris Wiki Species. Web. last-modified October 21, 2015. Unknown Author. ↑ 2.0 2.1 2.2 2.3 Tiger Anatomy Tigers-World. Web. Accessed January 20, 2016. Unknown Author. ↑ Tigers Tigers the Most Majestic Cats In the World. Web. Accessed January 20, 2016. Unknown Author. ↑ Tigers Skeleton and Internal Organs Tigers the Most Majestic Cats In the World. Web. Accessed January 20, 2016. Unknown Author. ↑ 5.0 5.1 Tigers Physical Characteristics Seaworld Parks & Entertainment. Web. Accessed January 26, 2016. Unknown Author. ↑ Tiger Reproduction Tigers The Most Majestic Cats in the World. Web. Accessed February 7, 2016. Unknown Author. ↑ Tiger Courting Process Tigers-World. Web. Accessed February 7, 2016. Unknown Author. ↑ 8.0 8.1 8.2 8.3 Tiger Facts and Information BioExpedition. Web. Accessed February 7, 2016. Unknown Author. ↑ 9.0 9.1 Tiger (Panthera tigris) Fact Sheet San Diego Zoo Global Library. Web. last-modified December 2, 2015. Unknown Author. ↑ Basic Facts About Tigers Defenders of Wildlife. Web. Accessed January 27, 2016. Unknown Author. ↑ Tiger Habitat Tigers-World. Web. Accessed January 27, 2016. Unknown Author. ↑ What do Tigers Eat Welcome to Tiger Foundation. Web. Accessed January 27, 2016. Unknown Author. ↑ Tiger Threats Tigers-World. Web. Accessed January 27, 2016. Unknown Author. ↑ 14.0 14.1 The State of the Tiger Panthera. Web. Accessed February 8, 2016. Unknown Author. ↑ Kasnoff, Craig. The Loss of Habitat for Tigers Tigers in Crisis. Web. Accessed February 8, 2016. ↑ Lin, Doris. What is Poaching? About News'. Web. last-modified November 24, 2014. ↑ Illegal Trade WWF. Web. Accessed February 8, 2016. Unknown Author. ↑ Tiger Poaching Tiger Homes. Web. Accessed February 8, 2016. Unknown Author. ↑ Day, Harvey. Save the tiger: Poaching facts Independent. Web. last-modified July 28, 2014. This page was last modified on 14 February 2017, at 17:48.